Migraines have a variety of symptoms and causes. This paper discusses the roles that some Foods may play in the prevention and causes of some migraines. Adrenal glandulars are a Food which has been used for decades by nutrition-oriented doctors when certain headaches are present. It has been recently noted that plasma norepinephrine levels have been found to be lowered in patients who suffer from cluster headaches . These types have been called “adrenal headaches” [2,3] with an etiological background of “overwork, exhaustion, worry, tension, tuberculosis” . Borage leaf and flaxseeds are a natural Food source of essential fatty acids. Platelet aggregation appears to be altered in migraine headaches and that platelet aggravating factor may be involved in the pathogenesis of migraine headaches . It has been found that prophylactic use of foods high in gamma-linolenic and alpha-linolenic acid can, after several months, reduce the severity and frequency of migraine headaches . This may be because gamma-linolenic acid competes with arachidonic acid for the active site of cyclooxygenase and it appears to reduce the production of inflammatory leukotrines . Borage seed oil contains 47.2% of linoleic acid and 23.1% of gamma-linolenic acid . Chromium GTF in Food is organically attached. Inorganic chromium “is very difficult to absorb”, but organically attached chromium 10-25 times “more easily absorbed” [9-11]. “Chromium may help reduce the length and severity of a migraine, especially if the migraine is due to hypoglycemia and/or emotional stress” . A double-blind trial showed that chromium can play a role in reducing the frequency and intensity of chronic headaches . Feverfewleaves are a commonly used Food by people with migraine headaches, especially prophylactically [13-15]. Feverfew is naturally rich in sesquiterpene lactones, the principal one being parthenolide . Parthenolides inhibit phospholipase A2, have antiplatelet activity, and have anti-white cell activity . “Feverfew may produce an antimigraine effect in a manner similar to methysergide maleate”  (Methysergide maleate, Sansert, is a known serotonin antagonist ). Liver glandulars are a Food which has sometimes been recommended by nutrition-oriented practitioners for some with headaches [2,3,17]. The liver is involved in blood sugar regulation, conversion of T4 to T3, and a variety of enzymes ; problems in any of those areas can contribute to migraines . Magnesium in Food is in a near-ionic state and is not a mineral salt (an industrial rock). Magnesium is reduced in the blood, saliva, cerebral spinal fluid, and brain when migraine headaches are present [19-23]. Reduced brain concentrations of magnesium can result in migraine headaches; reduced amounts of magnesium in mononuclear blood cells has been found in patients while experiencing migraines or auras associated with their occurrence . Niacinamide (vitamin B-3) in Food is not the same as the synthetic USP nutrient. Nicotinamide is a vasodilator . Nutrition-oriented practitioners have used vitamin B-3 to help people with migraines [9,25,26]. Pituitary glandulars are a Food which has long been used by doctors for headaches . Research strongly suggests that the pituitary gland is associated with headaches of many types [1,9,28,29]. “Often, with migraine patients, doctors view x-rays for evidence of swollen pituitary glands which can easily be defined in this restricted region. As stated in Harrison’s Textbook of Internal Medicine, ‘Enlargement...is frequently encountered in routine skull [x-rays] obtained in patients complaining of headaches...’ The swelling places pressure on the nerves in the cranium and this causes pain” . Thyroid glandulars are a Food which has been used by migraine headache sufferers since at least the 1930s . Dr. D.A. Versendaal (D.C.) recommends thyroid glandular supplements for people with migraine headaches . Low thyroid function appears to play a role in migraine headaches [9,26,30], but “The precise reason the thyroid is so involved in migraine is unknown...The thyroid gland exerts significant control over the circulatory system, and this is one reason disorders of the thyroid gland are related to migraine...Poor circulation with resultant reduced blood supply to the brain increases the risk for migraines” . 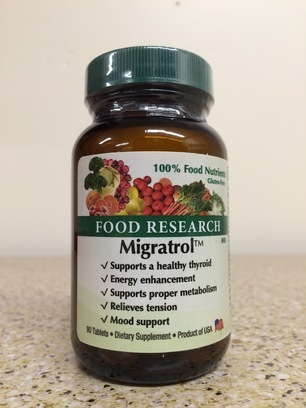 Many who do not have migraines have found that Migratrol can help provide nutritional support for improved thyroid health. Vitamin B-2 in Food is not the same as the synthetic USP isolate. A Belgian study found that consuming a daily single high dose of riboflavin (vitamin B-2) for three months improved average headache scores for migraine sufferers by about two-thirds, which was the same as aspirin . Various substances have been implicated in causing migraines . Some are rare and some more common. Perhaps the two most common are those containing caffeine or dairy [30,32] (inhaled chemicals are also a factor for many ). Dr. Alex Duarte places caffeine first in his list of foods which can cause migraine headaches . 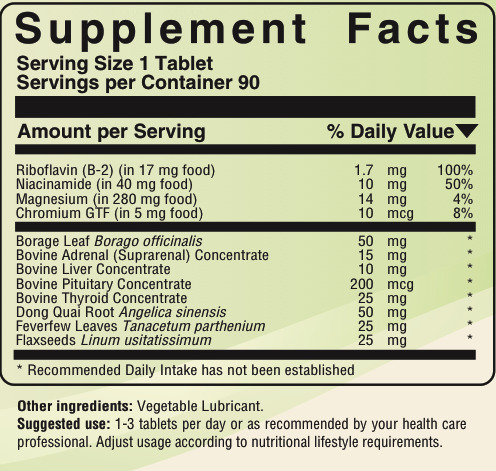 Many who take Migratrol also avoid caffeine and dairy products; while some also take Food Magnesium Complex or Food C Complex with it. For many migraine sufferers, it is best to taper off caffeine slowly in order to help avoid ‘rebound’ headaches.